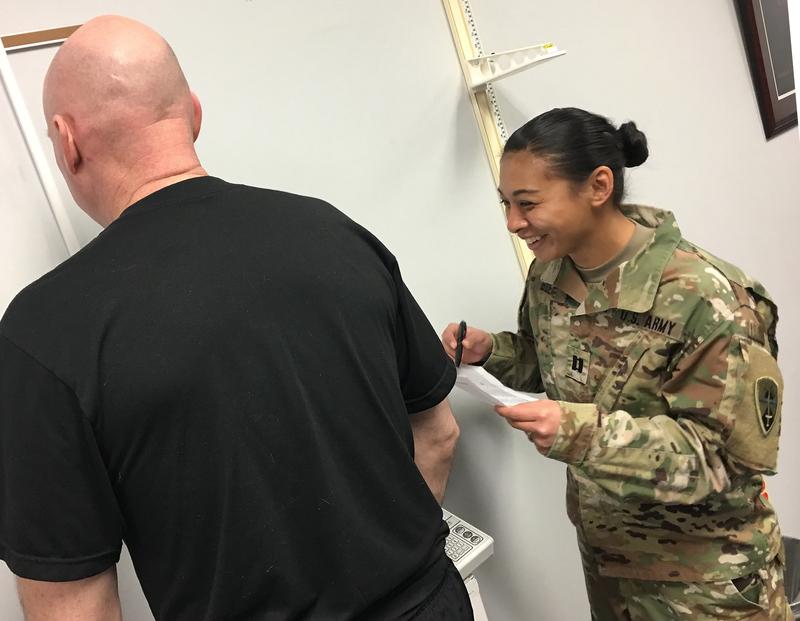 WEST FORT HOOD, Texas — Kicking off celebrating “50 Years of Operational Testing,” 43 Soldiers and Army Civilian employees here are taking part in an eight-week “Shredder” Weight Loss Challenge. The U.S. Army Operational Test Command is working with Fort Hood’s Army Wellness Center for an extra fitness education boost in the program that began Jan. 31. “Some of you might say you have a goal to lose 10 pounds,” said Noelle Austin-Jones, a certified personal trainer with the Wellness Center. “That’s a great idea, but that’s not really a goal. “A goal requires steps and action and an end goal, so we can help with that meaty part in the middle,” she said. The “Shredder” challenge began with an initial weigh-in with bi-weekly scale visits until March 28. With individuals and teams of three, winner incentives include time off when mission allows for the Civilian employees Soldiers. The first thing “Lego Techs” team member Argelia Alvarez did after signing up for the challenge was move her candy dish from her desk to another table in her office. “Even though I had started aligning my nutritional goals with consistent workouts, I was missing the accountability piece of being a team member,” said the administrative officer in the Test Technology Directorate. “I was surprised we tied it into the 50th anniversary,” Alvarez said. “I like the fact the command tied in the Civilians, because PT or weight loss efforts are typically tailored to the military, and so to see it come to the Civilians is nice. Operations NCO Staff Sgt. Scott D. Pangelinan’s only goal concerned his wardrobe. “I have a 36-inch waste right now, but I have a lot of 34-inch pants,” he said. Col. Christopher E. Albus, deputy commander and chief of staff of OTC, urged everyone to use the Wellness Center for advice and encouragement on diet, nutrition and exercise. He thanked everyone for getting involved. “I’m glad to be part of the team, and I’m glad that you are a part of my team as well, as we kick off this 50th Anniversary of the Operational Test Command,” Albus said. On Oct. 1, 1969, the origins of Operational Test Command were humble, and there were no ceremonies or unit colors when it began. A small group of military and Civilian employees banded together to launch the unique test organization — U.S. Army Project Mobile Army Sensor Systems Test, Evaluation and Review, or MASSTER — in a storeroom of the III Corps and Fort Hood headquarters, when it stood as a World War II-style building. MASSTER was only supposed to last as long as the conflict in Vietnam, but the test unit continued to 1976 when its name was changed to TRADOC Combined Arms Test Activity (TCATA). OTC’s name changed again Oct. 1, 1988 to TRADOC Test and Experimentation Command, or TEXCOM, and in 1999 it was re-designated as the U.S. Army Operational Test Command, or OTC. As the Army’s only independent operational tester, OTC tests Army, joint, and multi-service warfighting systems in realistic operational environments, using typical users to provide data on whether the systems are effective, suitable, and survivable. OTC is required by public law to test major systems before they are fielded to its ultimate customer — the American Soldier.